Our cleaning process is the finest cleaning process for carpets, upholstered fabrics, and tile known in the world today. We promise to perform our service in the most professional workmanlike manner. We do so using the most advanced equipment, specialty tools and techniques and cleaning solutions available in the industry. To give you the best possible service in the most efficient manner, your cooperation will help us to live up to our Service Guarantee. Of course, we must have electricity on site, should have water, heat and ideally A/C to do our job. Beyond the cleaning, we’re really hoping to give you a great service experience too! If anything has even been less than so in the past, and it makes sense for us to know, please inform us. We want to assure we don’t repeat the experience. Instead, our goal is to make it an “over the top, to the moon” experience so you are thrilled. And just like other services provided on your behalf, tips are appreciated for good service work delivered. Like server staff, tips are appreciated when we’ve earned our stripes! Before we arrive please let us know your reason for cleaning (i.e. an accident, you are moving, a party, allergies, pet issues, odor problems, new baby), there are instances where we focus on what we do based upon your reason for cleaning. If we gave you a phone quote, we will re-confirm the actual square footage and the job while on site. Phone estimates may be close in price to the actual if the information provided to us was reasonably accurate. Or, it might be off if the info provided was inaccurate. We always finalize all the cleaning details at the house, ask for your approval and permission to clean, and clean only if you do so. If the tech feels he’s got some suggestions, he might offer them. And, certainly, we welcome questions you have. One thing for sure, if there is a need to discuss cleanability, we will do so. We will clean only if we feel it will benefit you. If it is beyond cleaning, we will inform you of such cleaning, is not always an exact science. Most times cleaning improves things, but like cleaning clothing there are times when you are stuck with stains and other issues. Rest assured we will knock ourselves out to help you in every way. A note about the drying… it takes about as long as “hanging your clothes outside on the line to dry does.” Damp days slows the drying. Hot, steamy humid days also slows the drying. Couple suggestions: If it is humid or remotely warm turn the air conditioner on the night before, leave it on during the cleaning, and keep it on afterward. This will help tremendously. Don’t open windows unless it is a dry, crisp day. In spring, fall or winter, use your house fan and your heater. If you have a dehumidifier, fans of any kind use them. Use precaution walking on the wet floors & tell others or use wet floor signs. Please keep children and pets away from the work area. If we are working while pets are in the home, please safeguard them in a contained area. If we are there by ourselves, please leave clear instructions where the pets are, and any special instructions for them before we leave. Some thought needs to be given to where our truck needs to park. Mostly we prefer to park in the driveway, closet to our entry point. If you need to remove your car, please do so ahead of our arrival. We don’t want to set up only to discover we need to shut down so you can get your car out. Also, if we must park on the road, we want guidance, so we park with the closest access to your home. Beds on wheels may be moved. You can tip mattresses & box springs up, and we will clean under them. If that is appealing, clear out what is underneath them. Please move all small items of furniture, plants, lamps and baskets, décor, decorative items, any collectibles or family heirlooms away from the area to be cleaned. If you want heavy dressers moved if possible can you remove some of the heavier drawers- we are good at moving the basics but any help is appreciated. Please notify us of any special handling instructions we should be aware of if we are moving furniture & items for you (items with loose legs, top, weak joints, damaged items, etc.) If moving extra heavy or large bulky, delicate items please notify us, some times we need to arrange for extra help. Our guys are good, but if you would need a couple of guys for the moving, chances so do we. Just like you, we wouldn’t want anyone to get hurt in doing so, so letting us know is appreciated so that we may plan on your behalf! Please, pre-vacuum all the carpet to be cleaned. Notify me if there is a pet hair issue involved. If the carpet is heavily soiled not vacuumed we may have to vacuum and charge extra for it. Also, after the cleaning, don’t vacuum for 48 hours. In general- please prepare as best you can, but don’t go crazy. We do understand some folks can’t do much, which is ok, we’ll step in. Just tell me when you call me so we can plan accordingly. If we are proceeding in your absence- we will walk thru first. If we are there alone, please put post-it notes on the problem areas. It is our policy to call you ahead of setting up, so we finalize the cleaning with your input, and you are totally involved so there is no miscommunication. Also, we will discuss payment arrangements to settle pretty much at completion- either we will plan to meet you to secure a check or get a credit card while on the phone. If you greet us but plan to head out, please do not leave without giving us exit instructions. Again, we do expect to settle-up, so plan on finalizing your payment arrangements before you leave (most clients more than not are trusting and do so, and for your comfort, we always stand behind our work.) Waiting for you to return might impose on our next client. Thank you in advance for planning accordingly. Please note: Chances are if something is still there, we have used 1,2 or maybe more different spotters or efforts to get something out. If it’s still there it very well may be permanent. And if we leave a “permanent” stain card- it is for a reason, it is not coming out, it is a permanent stain. Also, in some cases when there is heavy soiling the fibers are rinsed of the dirt & mud, but the deeply impacted soils, even down below the carpet can travel back up & re-infect the tips during the drying. This requires a touch-up, which we are happy to do if needed. What do you do if you have spots that are still there? Colored spots, reds & others may lighten or may not. Reds fade to pink. White spots- kind of like bleach dribbles or whitish areas may just be that—bleached out & stained. Chances are we’ve tried a few different things and if they are still there, the spots are likely permanent. In our report back we’ll be honest, usually, that other attempts may, or more times than not, will not make a difference. What do you do if the traffic lanes are still there? Take a white towel, dampen it with plain water & rub in the traffic area. If the dirt transfers to the rag, a touch up should improve it. If not, the fibers are distorted or dulled from foot traffic and the abrasive soils will not come out- they are permanent. A Few Words About My Moving Policy—We move items that do not risk injury to our technician or damage to the item being moved. Please inform the technician if anything is fragile, already damaged or needs special handling. However, the moving is to be handled, we do so with your preferences with sensibility in mind. If you plan to move items- it must be done ahead of our set up for safety reasons. Our tools, hoses, and cleaning agents hamper and crowd the work area, and make navigating a bit tricky (a trip hazard), at best awkward or even slippery. Therefore, it is best you have everything cleared ahead of our set up. And, keep safe distance. Again, this is for your safety that we ask for your cooperation. If we will be moving things, please be assured we proceed carefully. Most times, the items will be moved just enough to clean under them, and then they will be carefully placed back in position with protectors underneath to keep them off the carpet till it dries. Protectors are needed when items are of wood, metal or cloth, wicker or clay. Plastic does not need them. All protectors should be left in place, for at least 24 hrs- before you remove them. We generally do not return to remove them. If you want to reset your items before the carpet dries, please ask us for some protectors. You can reset them safely without causing damage as long as you use the protectors. There are 2 types we can leave with you, blocks to keep heavier items up off the drying fibers & plastic tab squares for light items & furniture legs. About Protectant- You should really consider it. Your carpet came with it at delivery, but it breaks down with foot traffic. Protectant to carpet helps as much as changing the oil in your car does to assure optimal performance and preserves engine life… IT WORKS! Think of it like “A Coat of Wax”– the wax protects your car’s finish from abrasive items, sun fade or oxidation, and creates a buffer. So too, the protectant to the carpet. It creates a barrier that deters the grinding action from your foot, sock or shoe while helping with spots & spills. 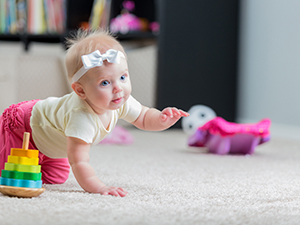 The bottom line and proven in laboratory research and recommended by carpet manufacturers—It works. My best clients know this secret, and how we keep their carpets looking fantastic. So give it some thought! Upholstery– it is best to stay off it until it dries. Also, rotate the damp cushions so the air gets to them. Leaving them in the same position can possibly cause them to brown out, requiring a touch-up. Ceramic Tile– you can walk on it wet, but try to have clean shoes or booties on. The grout will generally darken when wet and dry unevenly (it will even out in time.) Sometimes stains can remain, especially around toilets, in front of the dishwasher & really hi traffic areas. Wood Floors- you should plan to stay off them entirely for at least 2-3 hours. Don’t replace furniture or roll or move things on them for 24 hours. Again, and sorry but worth repeating, if the technician has done a good job, we are sure he/she would appreciate a good tip if well-earned. Thank you, in advance on behalf of the person who served you. Secondly, our other best compliment received are your reviews, put online. Reviews are genuinely welcomed, even considered the crown jewel of service well delivered, and one we celebrate when we have earned one. They help others seeking future work. And since this is so important, we are telling you in advance, we like to ask for your reviews and even encourage you to do one as we are there finishing up (so it makes it easy for you as you are still in the experience mode- getting it done and out of the way.) Likewise, Wendy may ask you to submit one on her follow up call or voice message, or in a couple follow up emails or thank you’s sent after the work is done. One last thing- we are pleased you have made this commitment to your clean carpets, fabrics, floors or furnishings. Now we encourage you to plan future cleaning too. We suggest you book now for your next appointment because we know people don’t clean often enough- it helps with appearance, it helps for health sake, and it helps protect your investment in it- a total win-win for you. If you do, we’ll take another $10 off your cleaning. Call Wendy to book an appointment, or I can call in your request. Whew- we went over a lot! But, having covered these useful items we believe this will be the best way to prepare for our work, and the best way to introduce the little things that make the experience as beneficial and successful as possible- we don’t want to leave a stone unturned and you unhappy! Without sounding corny, we really do want to make sure you over the moon pleased- and these tips help! In closing here, we begin by saying thank you for taking this time to prepare for your appointment, & we conclude in advance by thanking you for placing trust in us. It is our pleasure to serve you soon, and hopefully for years to come! If you haven’t already read about 10 Great Reasons We Should be Your Carpet Cleaner, now would be the time! Cleaning carpet has multiple benefits and should be done regularly. If you have cleaning already booked chances are there are other projects you might think of now that you are looking carefully at your carpets, fabrics & floors. Feel free to add them to your project, our technicians will expand the cleaning while they are there, or they will have the office book a second appt for you. Remember, a clean home is a healthy home. Call Wendy at Sparkle Surface Care(609) 953-0472 or contact us online to discuss your project, get your questions answered or schedule an appt to get it done- your carpet, tile, stone, fabrics, and hardwood are screaming for attention!